A flower of Hemitomes seen from above. The large yellow stigma is conspicuous. 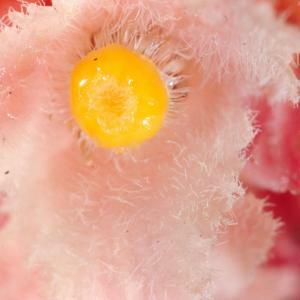 The very hairy nature of the inside surfaces of the petals is also evident. Why such a hairy flower? The hairs might keep small insects from climbing down into their flower and robbing the nectar. In that case, we would expect Hemitomes flowers to be pollinated by a long-tongued insect like a moth. The tongue of a moth could reach through the hairs down to the nectar at the bottom of the flower.